Essential oils have been used for many purposes for a long time. Unfortunately, it is not possible to trace back an exact time when they were first used. 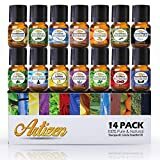 It is a fact that in Ayurvedic medicine essential oils have been used for medicinal purposes for many hundreds of years: the Egyptians already knew the technique of distillation, the ancient Greeks used oils for medicinal purposes and the Romans loved perfumes and the rich use of perfumes. They also knew the antiseptic effect of certain plants, so the use of essential oils continued through the centuries, during which the distillation process was perfected until pharmacists sold more essential oils in the 17th century. Since then, many secrets have been revealed about the extraction of essential oils and their constituents, and their importance in alternative medicine has not declined to this day. Essential oils are also used in the production of solvents and perfumes. There are three ways to extract essential oil. The most common method is steam distillation, in which steam drives the oil out of the plant, then condenses it and separates it from the water. cold pressing is used only for citrus oils, while extraction is mainly used for flower oils, in which a solvent dissolves the soluble flavours and colours from the flowers.The very elaborate and expensive Effleurage, as it is known from the novel “The Perfume”, is hardly used anymore. The further processing depends completely on the effect which the essential oil should have. In most cases, it remains unchanged, but it can also be removed in concentrated or undesirable form. Unfortunately, the extraction of purely natural oils has declined considerably, as synthetic processes are more cost-effective and more profitable. Humans can make use of the defence mechanisms of plants, because the antibacterial, antiviral and fungicidal substances obtained from the plant extract are just as effective in humans as in the plants from which the essential oils are obtained. It is well known that incense has an antibacterial effect and smoke has been used for many centuries in natural medicine. 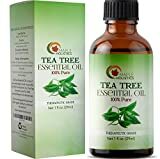 Tea tree and thyme have an antifungal effect and tea tree oil is one of nature’s universal geniuses. Peppermint also belongs to the group of plants whose inhaled ingredients have a mucolytic and cough-stimulating effect. Aroma substances are used in scented candles and massage oils and are used for a wide variety of therapeutic purposes. The calming effect of lavender or the stimulating effect of rosemary is well known and widely recognized. The aphrodisiac effect of sandalwood, for example, is strongly doubted, and essential oils are used not least in aromatherapy, even if the effect of this therapy has not been confirmed by scientists. Disturbances of well-being – mostly of a mental nature – can thus be successfully combated. When buying, make sure that the essential oil is 100% pure. This means that it has really only been obtained from plants left in their natural state and not synthetically produced. Furthermore, an oil should never be used pure. Dosage instructions for various fields of application can be found on the package insert. It makes a difference whether you treat a light burn with lavender oil on your skin, or use lavender oil as an aphid control additive. Set of eight 10 ml. essential oils provides multiple aromatherapy healing, cleansing and fragrance benefits. 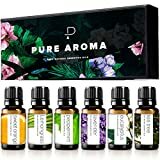 All eight oils derived using the latest steam-pressing techniques. Ideal for skincare when used as directed with a carrier oil, such as Art Naturals' Jojoba Oil. Ideal for use in diffusers, vaporizers or humidifiers. Allergen-free alternative to candles or incense. 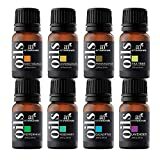 THERAPEUTIC GRADE ESSENTIAL OIL SET - Natrogix Bliss holds nine (9) painstakingly extracted essential oils. 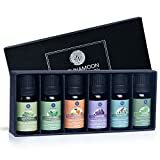 Used alone (external use only), or combined together in exquisite sensory recipes, these oils breath fresh relaxation, joy and healing into any environment. THE PERFECT COMBINATION - Natrogix Bliss contains the 9 most popular essential oils on the planet. These oils are popular for a reason; their properties are well-known and their wonderful effects backed by evidence. Bliss is the perfect gift, starter set, or expansion of a healthy collection. Our oils are carefully sourced all over the world. DELICATE OILS PROTECTED - Cradled inside each beautiful box of Bliss are nine 10ml bottles with easy-use droppers. The gold amber tint of the strong bottles guard the precious, delicate oils from light and UV degradation. All natrogix oils are bottled in FDA certified facilities in the US. HIGHEST QUALITY GUARANTEED - We are truly proud of Natrogix Bliss. All 9 oils are GC/MS certified, and NO pesticides, herbicides, GMOs or other additives. Please kindly understand smell is NOT everything about essential oils. Their main job is to be absorbed into our system by breathing and through skin absorption, to promote health and wellbeing. Some oils smell "chemical" because of containing 100% natural chemicals form the plant such as alcohols, aldehydes, esters, ketones, etc. FREE RECIPE E-BOOK - We've created 200 custom recipes for your Natrogix Bliss set, and you get the book free with today's purchase. Discover soul lifting combinations that will intrigue you at first... and then become something you can't live without!